Punch huge holes with pinpoint accuracy, plain and simple. It doesn't just look intimidating. It FLATTENS whitetails with devastating ferocity. Guided by Remington®'s new Power PortTM Tip, AccuTip Sabot Slugs delivers a degree of accuracy and terminal performance unmatched by any other. This masterpiece of aerodynamics consistently prints tiny 100-yard groups and transfers tremendous knockdown force to the farthest reaches of shotgun range. It’s the largest tipped slug you’ll find anywhere. In field testing, these huge slugs produced gaping wound channels and crumpled every deer it touched with a single shot. From 5 to 200 yards, it yields perfect mushrooms and over 95% weight retention thanks to its spiral nose cuts and high-strength cartridge brass jacket. Designed for rifled barrels only. Remington Premier, 20 Gauge, 2 3/4 , 260 Grain, AccuTip Bonded Sabot Slugs, 5 Rounds is rated 4.9 out of 5 by 31. Rated 5 out of 5 by Gary1959 from Price ok Best slug for savage 220 tried them all great performance very accurate. Rated 5 out of 5 by Bill from 20 gauge accu Tip Shoot these in my Savage slug gun, most accurate at 100 and 150 yds of all the brands that I tested. Rated 5 out of 5 by Hutch from Best round in my gun! I hunt with a Harrington Richardson heavy barrel single topped with a 6X Burris signature series scope. Tested every brand I could find in 2-3/4 and 3" and none came close to the Remington Accu-tip... or "whistler" as we refer to them here. My gun consistently prints 1" groups from a rest at 100 yds. and I can hit beer cans at 200 all day long. 2-3/4" much more accurate and consistent than 3" rounds regardless of brand in my gun. Love em!!! Rated 5 out of 5 by Dave from Great Deal Best price anywhere for these Accutips. Shipping charges are also very fair. Will use The Guide again. 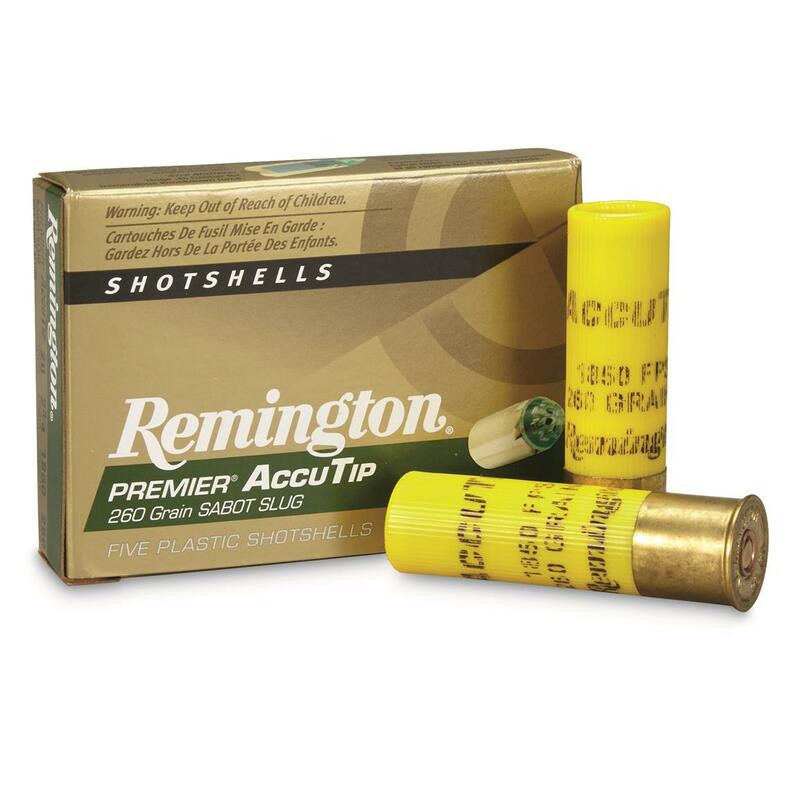 Rated 5 out of 5 by Jimbo from Acccurate Slug I took these Remington slugs and two other name brand competitors to an indoor range to check for accuracy in my Savage 220. Hands down the AccuTip proved to be the best. In the field the kinetic energy proved to shorten any tracking time if any at all.